Yesterday saw the biggest gathering of people in Hall H I’ve seen this year and it was pretty obvious what people were waiting for. Sony actually brought four films to the stage of Hall H this year. Directors Neveline/Taylor were on hand with Nicholas Cage to present footage from their new film “Ghostrider: Spirit of Vengeance”. “Zombieland” Ruben Fleischer was on hand with stars Aziz Ansari, Nick Swardson and Michael Pena to bring audiences a hilarious look into “30 Minutes of Less”. Len Wisemen was sowing off some early work of his reboot of “Total Recall”. The beautiful cast present for the panel included Colin Farrell, Kate Bekinsale and Jessica Biel. However, the film batting clean up, and the one we had all waited for that day was Marc Webbs “The Amazing Spider-Man”. With all the great discussion that took place and the fantastic footage we saw, nothing compares to how the panel began. This moment will be what people talk about longer after the con is over and is the exact reason you come to this convention in the first place. As local radio show host Ralph Garman was set to bring out the Spidey panel, a nervous skinny kid ran up to the audience mic and interrupted Ralph. He said he only had one thing to say as Ralph asked him to leave because he needed to start the panel. The boy seemed obviously nervous underneath his extremely cheap Spider-Man costume. As Ralph did his best “acting frustrated” impression, the boy took off his mask to reveal our young new star, Andrew Garfield. In a moment that could only happen at San Diego Comic-Con, Andrew went into what could only be described as one of the most heartfelt introductions I’ve seen. He spoke about how he had always wanted to come to Comic-Con and felt that the best way to do it for the first time was to get down on the floor to talk to us. I was able to grab my camera fast enough to record the best part. Bare with me as the video is from my iPhone. He goes on to talk about why Spider-Man was so important to him growing up and how he felt at the opportunity to play this character. 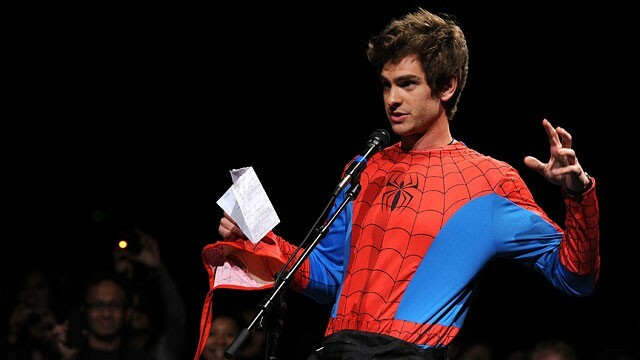 Really, I feel like he was saying, I love Spidey too and I want to know that you will accept me as, 1.) a fan and 2.) Spider-Man himself. It was easily the highlight of the day to see him completely overwhelmed, not at the fact that he’s playing the title character, but that he had finally made it to Comic-Con. We watched the new trailer, which actually debuted earlier in the week online. However, I knew they would show it during the panel so I abstained from watching it online. Thank god I did because seeing it in 3D on the big screen with that audience only made the trailer that much better. I think it looks great and that first-person ending was really impressive. The panel continued with a basic Q&A from the crowd that brought now incredible highlights. However, unlike the “Total Recall” panel that proceeded Spidey, the cast/crew seemed seriously devoted and in love with not only the movie they’ve made but with the characters they’ve helped create. We were treated with an exclusive detailed look as some much more tender moments in the young boys life. The film seem much more grounded in the drama this time around. Andrew Garfield feels like me when I was in high school. The film deals with the idea of Parker having to hide this secret and how that plays out over the course of the film. Then the action started and it didn’t disappoint. Marc Webb has been pretty vocal about not relying too much on CGI, like the first series did, and sticking to practical effects as much as they could. It shows and it’s fantastic. In fact, some of the footage was so raw that we could still see some of the wirework from the web slinging. I have to really say that the practical effects really seem to ground the film in reality. If feels like Parker has a talent more then a superpower, I fell like that will be easier to relate to when people see the finished product. Now, the film does has a great deal of CG so don’t except all stuntmen all the time. After we screened that sizzle reel of goodness, it was clear that we hadn’t seen our villain yet. In another con surprise Rhys Ifans, who plays Dr. Curt Conner’s aka The Lizard, took to the stage as they ran an exclusive look at his character and transformation. This is where that CGI comes into full view. Conner’s Lizard looks really impressive as a design element, but I’m afraid the real web-slinging mixed with the switch to CG could be an issue, albeit a small one. I feel strongly about supporting this film. All the right elements seem to have come together on this film.